I have a minor obsession with pasta sauce. I've been known to eat it straight from the jar. Often. 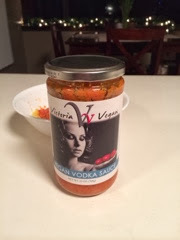 My favorite kind of pasta sauce (besides the 365 brand original pasta sauce from Whole Foods) is vodka sauce, but since I've gone vegan, I haven't had too much of it since it's typically made with cream. I make a decent vegan spicy tomato cream sauce myself, but I don't always have time to whip up a sauce from scratch. I always look for new vegan foods when I'm wandering around Whole Foods and I stumbled upon Victoria's Vegan Vodka Sauce a couple weeks ago. Like most cream sauces, this isn't a "healthy" food by any means, but once in awhile a little gluttony won't kill you. And I've noticed that a little bit of this sauce goes a long way, so if you're counting calories like I am, you probably don't even need to use one whole serving on your pasta. We tried a creamy pesto sauce from Victoria and I wasn't nearly as impressed, but I still plan on trying some of their other vegan options. This is definitely worth checking out if you love vodka sauce and don't have the time to make it yourself. It's so good that no one will guess it's vegan - or from a jar.